The fifth and last race in the FinTrack Indoor series was held this weekend in Riihimäki, about 70 km north of Helsinki. It would be the first race for me there and I have to say that the facility was really good. 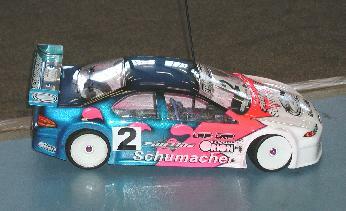 The track was a copy of the LRP Touring Car Masters track in Germany. It was a bit smaller though, as the lap times were around 10-11 seconds, while at the LRP race they have been around 14 seconds. I had not practiced at all since the last race 5 weeks ago so when there was a chance to race both days at Riihimäki I grabbed it with both hands. On Saturday there was the last race in the FinTrack Indoor series and on Sunday just a national race with a much smaller start list, but still very impressive. In hindsight I'm very happy that I run both days as the track was the best carpet track I have ever raced on. Began with a 3.5 hour drive...and we were at the track at 07.00...so as you can imagine we started quite early. As I knew beforehand that the track would be a copy of the LRP track I had a setup on that was basically Masamis setup from last years race there. So the day started with free practice in heats with about 15 drivers. It's always quite hard to get a clear picture of how the car is working with so much traffic on the track, but I was reasonably happy with my car. The fast guys were like usual Teemu with the Axis and the Ahoniemi bro's with their Corally's. Teppo Kauppinen (a.k.a. TC3 nerd..) made an interesting comeback to the touring car scene after a 9 month break...now running the Associated car (don't you think you would have done better with the SW, Teppo? hehe). Qualifying started badly for me. Was making mistakes and the car was a little difficult. I made some changes to make it better, put red (GT4) springs front and changed tires. My only set of Pit's was beginning to wear out (not possible to get them here anymore) and since the grip was getting quite high I mounted a set with Yokomo 138M's that I raced for the rest of the day. So in second qualifying the car was a lot better but I was pushing too hard and made mistakes. So for the final qualifying I had to get a decent run...did not want to race a c or d final! Well, I managed to put a decent run together which placed me in the b final. I would have liked to be a bit higher up but... The car was working well now and I was quite happy with my lap times, I think my best lap time was 10.8 seconds which was not too far off what the top drivers did. 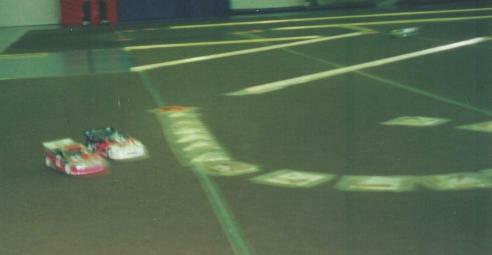 Sakke was TQ ahead of Teemu although Teemu looked to be the faster, he was just making small mistakes. My own finals was no high point...my car was becoming a bit difficult again. I should have changed tires to the 138G's as I would find out later. The a finals were well worth watching though. Teemu and Sakke put on a great show as they have done so many times this winter, so much fun watching them battle. Teemu won it in the end ahead of Sakke and Simo. We stayed at the track after the race on Saturday and got a couple of practice runs before we headed off to the hotel. In practice I tried the 138G's and found the car much easier to drive with those. I also tried some new setups on the rear suspension (read about this in the new parts tested section). In practice on Saturday night and in the beginning of Sunday many drivers run the HPI tires that are the control tire at the LRP race and 12 turn motors, but the competitive instinct took over for most and they put those things to the side! Myself I run with 12 turn motors all day and I was positively surprised with their performance. My results were not very good in qualifying. I was basically running with a rear end setup that did not work. See the problem was that even though the car was very fast it kept grip rolling as soon as I touched a tape line. Actually my lap times were around 10.5 on Sunday, and that's with a 12 motor compared to the 8 I was running the day before, so I was really happy with that and that's why I did not change it soon enough. I was hoping that I could keep it together for 5 minutes but I couldn't, but I guess a better driver could have. After I changed the car back to what was a lot easier to drive my lap times were still only 0.1 slower so that was the right thing to do. Anyway, my 10.5 lap times were actually very close to the leaders, so I was happy with that again as I was running a 12 turn. For the finals (B) I got my car working well and I think I was pretty much the fastest car. I got second in the first one after starting 7th, helped by other people crashing like mad people... In the second final I was about to take second place after 5 laps when someone decided it was a good idea to crash and land in front of me as I turned in at the end of the main straight, full throttle. The result was a broken caster block, kingpin screw and a badly bent driveshaft (xtra hard universals). That was a bit sad as I was coming up through the field and having a good time...but those things happen. Teemu, Sakke and Simo Ahoniemi put on a good show on Sunday as well. Simo was TQ and they all won one final each but in the end it was Simo winning it. There was 49 racers in mod on Saturday and 21 on Sunday. So now the carpet series is over here and it's time to wait for the summer. Overall we had about 70 racers in the mod class in the FinTrack series which I think is quite a good turnout. Actually there is still one carpet race in Finland next Saturday but I won't go. Good Luck to those who will! Some of us Finnish drivers will head to Germany 6-8.4 for the LRP Touring Car Masters which will then definitely put an end to the carpet season. For me the asphalt season can't come soon enough since I have always enjoyed racing outdoors much more than indoors. The calendar for this summer also looks promising with quite a few touring car races so hopefully it will be a great season!